Food and beverages manufacturers, today, are responding by reformulating products and providing clean label products. Processed food manufacturers are focusing on investing in the expansion of existing production plants, and setting up of new plants to increase the production of processed food such as meat and seafood products. This, in turn, is expected to boost the demand for liquid smoke/wood vinegar that is used to add a distinct flavour in certain processed food products. Wood vinegar manufacturers across the globe are increasingly focusing on using different types of wood as raw materials to produce products with distinct flavors. In addition, these manufacturers also focus on blending two or more raw materials for product differentiation. The global wood vinegar market is, however, currently restrained by the lack of consumer awareness about liquid smoke products in certain developing countries. Revenue generated from wood vinegar market was approximately US$ 1,295.4 Mn in 2017 and is expected to increase at a CAGR of 4.9% over the forecast period, 2017-2025. By the end of 2025, the market is expected to be valued at around US$ 1,896.8 Mn. Wood vinegar is a by-product of charcoal production, and is produced from the destructive distillation of wood. Wood vinegar has several applications where it can be used as a natural plant-derived pesticide, herbicide, plant growth promoter, fungal growth enhancer, and in several other applications. Biomass-based products are becoming immensely attractive, and the introduction of effective and more efficient pyrolysis technologies has improved overall yield, resulting in valuable production generation. Furthermore, the growing consumer demand for organic food products is compelling manufacturers to bring in all 'natural' and 'organic' products to the marketplace. This has, in turn, fueled farmers’ interest in organic farming, and hence, the concept of organic fertilizers and pesticides. Collaborative efforts to bring such products are in process, thus creating opportunity for the market growth of wood vinegar in the near future. Companies in the market are focusing on new product launches, and brining products in the marketplace that are natural and at the same time very affordable. Wood vinegar is obtained from charcoal, and is widely used in the agriculture industry in order to improve the overall production of crops. Wood vinegar acts as a fertilizer, where it improves soil fertility, allows better uptake, and reduction of up to 50% of fertilizers, herbicides, and pesticides. Manufacturers of wood vinegar need to efficiently meet the requirements of various end users in different applications, while ensuring the supply of the required products, as quality and positive outcome are of utmost importance to the end-use industry. Some of the restraints that are potentially restricting the growth of the wood vinegar market is that wood vinegar is produced from several organic sources. However, there are various challenges associated with the sourcing and manufacturing of wood vinegar from these similar natural sources, which may lead to repeatable/dependable results, thus limiting their use across several industrial domains. Furthermore, much of the wood needed for charcoal production comes from natural forests, leading to forest harvesting. Charcoal production is one of the major reasons for deforestation across the globe. As the standard of living across developed and developing countries rises, the demand for charcoal and its by-products, including wood vinegar for energy production, also increases. This has pushed governments to release regulations on the production and distribution of charcoal and its derivatives, thus limiting overall charcoal production, hence the production of wood vinegar. 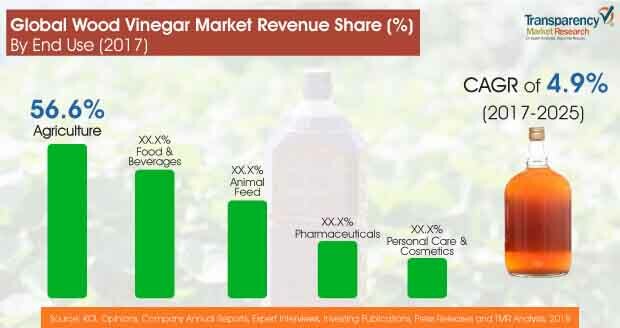 By end use, the wood vinegar market is segmented into agriculture, food and beverages, animal feed, pharmaceuticals, and personal care and cosmetics market. Agriculture segment is further sub-segmented into pesticides, fertilizers, bactericides, and others and food and beverages sub-segmented into mat and seafood, sauces, dairy products, snacks, and others. The agriculture segment is likely to be the most attractive segment in the forecast period owing to its several applications where it is used as a natural plant-derived pesticide, herbicide, plant growth promoter, fungal growth enhancer, and in several other applications. On other side, among food and beverage segment, meat and seafood sub-segment is anticipated to occupy the largest market share of 60.1% in 2017 end. The dairy products sub-segment is expected to register high growth rate during forecast period. On the basis of production method, the wood vinegar market can be segmented into rapid pyrolysis, intermediate pyrolysis, and slow pyrolysis. Among, production method segment, slow pyrolysis segment is expected to be valued at approximately US$ 48.2% by the end of 2025. On the basis of region, wood vinegar market is segmented into North America, Latin America, Europe, Asia-Pacific, and Middle East and Africa. Wood vinegar market in APAC and Europe is expected to dominate over the forecast period followed by North America. The rapidly increasing population and rampant Westernization across Asia Pacific is leading to the rising consumption of meat products, worldwide. This, in turn, is projected to increase the intake of processed meat products, thus boosting the demand for liquid smoke/wood vinegar for imparting flavor and preservation. An important observation highlights the fact that consumers in Western regions such as North America and Europe have a strong preference for smoked food products, whereas those in other regions such as Asia and Africa have a palate for non-smoked food. Some of the major companies operating in the global wood vinegar market are Dongying Runyi Biotechnology Co. Ltd., Merck KGaA (Sigma Aldrich), Canada Renewable Bioenergy Corp., Kerry Group PLC, Frutarom Industries Ltd., Agribolics Technology Sdn Bhd, VerdiLife LLC., Red Arrow International LLC, B&G Foods, Inc., Baumer Foods, Inc., TAGROW CO., LTD., and New Life Wood Vinegar. Transparency Market Research offers 8-year forecast for the global wood vinegar market between 2017 and 2025, according to which the market is expected to register a CAGR of 4.9% during the forecast period. The primary objective of the report is to offer insights on the advancements and opportunity in the wood vinegar market. The study demonstrates market dynamics that are expected to influence the current challenges and future status of the global wood vinegar market over the forecast period. This report also offer updates on trends, drivers, restraints, value forecasts, and opportunities for manufacturers operating in the global and regional wood vinegar market. Wood vinegar, also known as pyroligneous acid or liquid smoke, is a natural extract from wood, and is widely used in organic farming across the globe. Wood vinegar is a dark liquid extracted through the process of destructive distillation of wood. The main component of wood vinegar is acetic acid, which accounts for 3-7% of the total ingredients, and 50-70% of the organic matter. Apart from this, wood vinegar also consists of water, phenols, methanol, and ethanol. Wood vinegar is widely used as a fertilizer and pesticide in organic farming. Apart from this, it is used to give a smoky flavor to various food products in the food and beverage industry. Other applications of wood vinegar are in pharmaceuticals, personal care and cosmetics, and animal feed industry. On the basis of end-use, the wood vinegar market is segmented into agriculture, food and beverages, animal feed, pharmaceuticals, and personal care and cosmetics market. Furthermore, agriculture segment, is sub-segmented into pesticides, fertilizers, bactericides, and others and food and beverages sub-segmented into mat and seafood, sauces, dairy products, snacks, and others. The agriculture segment is likely to be the most attractive segment in the forecast period owing to its several applications where it is used as a natural plant-derived pesticide, herbicide, plant growth promoter, fungal growth enhancer, and in several other applications. On other side, among food and beverage segment, meat and seafood sub-segment is anticipated to occupy the largest market share of 60.1% in 2017 end. The dairy products sub-segment is expected to register high growth rate during forecast period. On the basis of production method, the wood vinegar market can be segmented into rapid pyrolysis, intermediate pyrolysis, and slow pyrolysis. Among, production method segment, slow pyrolysis segment is expected to be valued at approximately US$ 48.2% by the end of 2025. The report includes market share of each segment according to the region with analysis towards market trends respectively. A section of the report highlights wood vinegar demand. It also provides a market outlook for 2017–2025 and sets the forecast within the context of the wood vinegar, including the end use of wood vinegar in different industries. This study discusses key trends contributing to growth of the global wood vinegar market, as well as analyses the degree to which drivers are influencing the global market. In the final section of the report, a competitive landscape has been included to provide report audiences with a dashboard view. Key categories of providers covered in the report are wood vinegar’ key players of the global wood vinegar market. Detailed profiles of the providers are also included in the scope of the report to evaluate their long-term and short-term strategies, key offerings and recent developments in the wood vinegar space. Key players in the global wood vinegar market includes Dongying Runyi Biotechnology Co. Ltd., Merck KGaA (Sigma Aldrich), Canada Renewable Bioenergy Corp., Kerry Group PLC, Frutarom Industries Ltd., Agribolics Technology Sdn Bhd, VerdiLife LLC., Red Arrow International LLC, B&G Foods, Inc., Baumer Foods, Inc., TAGROW CO., LTD., and New Life Wood Vinegar. In addition, it is imperative to note that in an ever-fluctuating global economy, we not only conduct forecasts in terms of CAGR, but also analyze on the basis of key parameters such as year-on-year (Y-o-Y) growth to understand the predictability of the market and to identify the right opportunities. Also, another key feature of this report is the analysis of all key segments in terms of absolute dollar. This is traditionally overlooked while forecasting the market. However, absolute dollar opportunity is critical in assessing the level of opportunity that a provider can look to achieve, as well as to identify potential resources from a sales and delivery perspective in the global wood vinegar market.